I have been a letter-writer since I was in elementary school, a perk of growing up before the age of the Internet and text messages. 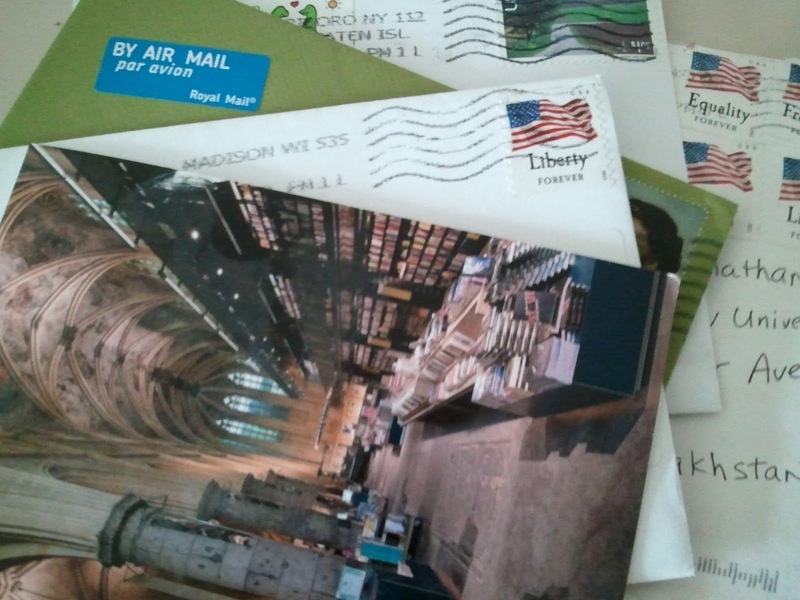 My first pen pal was my grandfather, my mother’s father who died 16 years ago last week. I remember the excitement that came with receiving one of his letters from India, old-fashioned blue aerogrammes penned with royal blue fountain ink. Initially, our correspondence began within the body of the letters he and my mother wrote each other, but the volume of our writing grew until eventually they merited their own, separate envelopes. Nothing in those letters was particularly revolutionary: I would bore him with mundane details of my schooling adventures, and he would remind me to be a good girl, which largely involved listening to my parents. Occasionally I would include snippets of a story I was writing – I had grand dreams of becoming a novelist at age 9 – and his next letter would include a critique of those excerpts. It is quite possible this childhood hobby would have died with my grandfather had it not been for my discovery of Jane Austen around the same time. Awkward 13-year-old me, about to enter high school, found refuge in the witty but benign predictability of Austen, not to mention crushes on all her heroes, who were far superior to any boy my age. Austen was my gateway to the Romantics and Victorians: the Brontës, Eliot, and Dickens. Heroines in those books were overwhelmed by letters: from confidantes, family members, potential suitors, and the one aunt in London, who would issue that coveted invite to spend “the season” in the capital. I longed for my confidantes to send me pages of their deepest thoughts, penned in secret late at night, and for suitors to court me via handwritten love letters. While my success rate in getting potential lovers to woo me with letters is fairly low (I’ve managed it once or twice – not bad in this day and age – though they were never quite as epic as I had hoped), I have sustained lengthy letter-writing relationships with several good friends since high school, many of whom have written me while I was abroad in Russia, South Africa, and, now, Kazakhstan. These written conversations have chronicled my life – and our relationships – in ways no Facebook timeline, or email thread ever could match, and these friends are special in that they know with me an intimacy that might remain unparalleled even in marriage. While the frequency of the letters may be appalling to a 19th century denizen, the quality and depth of the feelings conveyed in those pages would be worthy of even Emma Woodhouse, the most judgmental of the Austen heroines. Earlier this summer one of these friends announced her pregnancy to me via a letter. Though I already knew about this milestone via more “conventional” sources of communication, the letter represented a capstone on eight plus years of correspondence that captured our journey through post-college existential crises about adulthood. Within the pages of letters and cards, we commiserated over moving far away from family and friends to pursue our careers, being picky over the men we met (or not meeting men), meeting the men we would eventually marry, and forging new paths for ourselves. Around the same time, another friend, with whom I have had a steady – if not always frequent – letter-writing relationship since high school, showed me my entry in her address book: a veritable map of my life for the past dozen years. Though I strongly advocate advances in technology that make it easier for people all over the world to communicate -- I can hardly imagine how my ultra long-distance relationship would have survived without Skype -- these advances could never replace the perfect joy of receiving a handwritten letter from a friend or loved one. Because, simply put, a handwritten letter is intimacy wrapped in time-honored ritual stuffed inside an envelope. It is both personal in that it’s addressed to you and public in that it can survive into posterity. It is a time capsule, preserving a moment in a relationship between two people, as well as a relic, fading in importance in an age of instant communication. Without the benefit of a backspace button, a letter can be both reckless and thoughtful at the same time, allowing the writer to compose with haste, or with great care. Of all the forms of communication available to us, handwritten letters are the most human, filled with flaws and bursting with feeling. I loved this! Your description of the letter as a piece of intimacy, written in the spur of the moment or thoughtfully composed captures it all. I also like your nod to the Romantics and the Victorians who wrote copiously--as someone who read all of Dickens's letters for a project I can attest to this. In this fast paced era it is nice to pause and think about the material power of the missive in the envelope carrying the thoughts of a dear one. Something that an email communication surely lacks! That is very nice to know anna! Thanks for this. Must go back and read letters I wrote Amma where I mentioned Doris Lessing and Pablo Neruda amongst others. Adding to appa's comments, and Anthony Burgess :) All three writers were unknown to me then! Malavika: I must add that perhaps Emma Wodehouse may not have been judgmental as much as she would have wanted to marry you all off to the most unsuitable of men!! Haha. After writing this, I totally felt guilty and stated a letter to you on the train! Also, when I get back to the States, I need to go through my boxes to find that little notebook... I know it's there SOMEWHERE. Hi Malavika, what a nice post, and so well written. I share your sentiments, as someone who spent a long time in the letter-writing and pre-computer era, as well as a Jane Austen fan. I read Pride and Prejudice for the first time on the upper berth of a train from Bombay to Madras; I think we were travelling to Madras to clear up my father's Madras home after his mother, my Patti's death (I would have been 12).All I remember is that I could not put that book, with its tiny print, hard to read by the dim light on that upper berth, down. It was a tiny book as well, one of those hardcover Collins (pocket?) editions. Raja might remember to whom it originally belongesd-- my mother? Ramaswamy Thatha (your grandfather's father)--whose collection of gold-edged prize and other books was spectacular? or my father, Appa? In any case, I was hooked. As for letter writing, I remember waiting for the blue 'aerogrammes' from Bombay week after week when I spent an entire year, from age 17-18 as an exchange student in Concord, MA. Everyone wrote letters. We could not make phone calls, it was forbiddingly expensive even for my American family, and we did not have a home telephone in Bombay. And you might have seen the charming old postcards your Thatha sent from Germany in the 1950's--I can still visualize them. You are very lucky to have grown up with those lovely letters from your grandfather. Raja and I have saved some of the letters our Thatha (your great grandfather) wrote to us-- he always quoted an appropriate verse from the most beautiful Sanskrit poems. Thanks for this very nice essay!